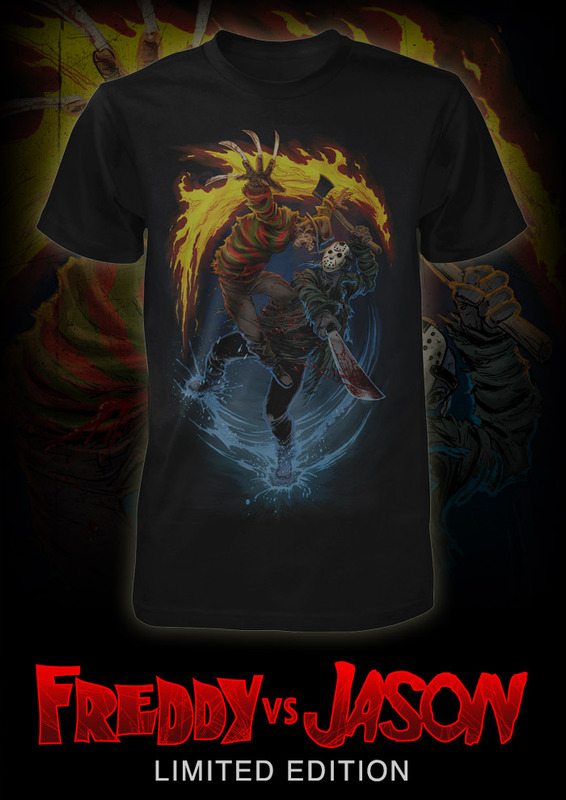 We posted a story a few days ago about Fright-Rags teasing a brand new Freddy vs Jason shirt design which got a lot of people excited. It was only a matter of time before the full shirt design and ordering information was revealed and the Horror shirt company has now done just that. - ONE WEEK ONLY : This t-shirt will only be available from 10:00am EST Tuesday, March 19 through 10:00am Tuesday, March 26 at 10:00am EST. As soon as the clock strikes 10:00am on Tuesday (3/26), the link to this limited edition t-shirt will no longer be available. Please note that this is Eastern Standard Time, so check your time zone as these times may be earlier or later, depending on where you live. - PRE-ORDER : This shirt will be a pre-order, so please allow approximately 4-5 weeks to ship your order. Actual shipping transit time will vary based on your location. Any additional (in-stock) shirts added to your order will ship when your order is complete. If you want your in-stock shirts to ship faster, please place a separate order.